After a recent Chrome update, I noticed that the elements tab in my development tools theme was no longer functioning and became a bit unreadable with the default styles. This also happened a year or so ago as well when Chrome stopped supporting the custom css rules for the development tools web inspector. I use Chrome, Safari, and Mozilla developer tools and I think each have nice debugging and consoles, but I’ve always been particularly fond of Chrome because I keep it customized to match my other editor themes. I’ve flipped themes over the years. I started on Notepad++ using a dark theme because it seemed to mimic a terminal window. I read an article about halation and switched back to a white background. I migrated over to Textmate and started using the Sunburst theme and the Menlo font. I switched to Solarized when that came out. When I was watching Railscast, I switched to that theme. When Sublime Text first came out, I switched to Monokai. I started using Atom and switched to Base16 dark. However, I always seem to switch back to Sunburst with the Menlo monospaced font and have continued to use that theme in every editor I use. I’m not exactly sure what it is I like. It could be just habit at this point but I can say that the cool blues, mellow yellows and oranges fit me just right. 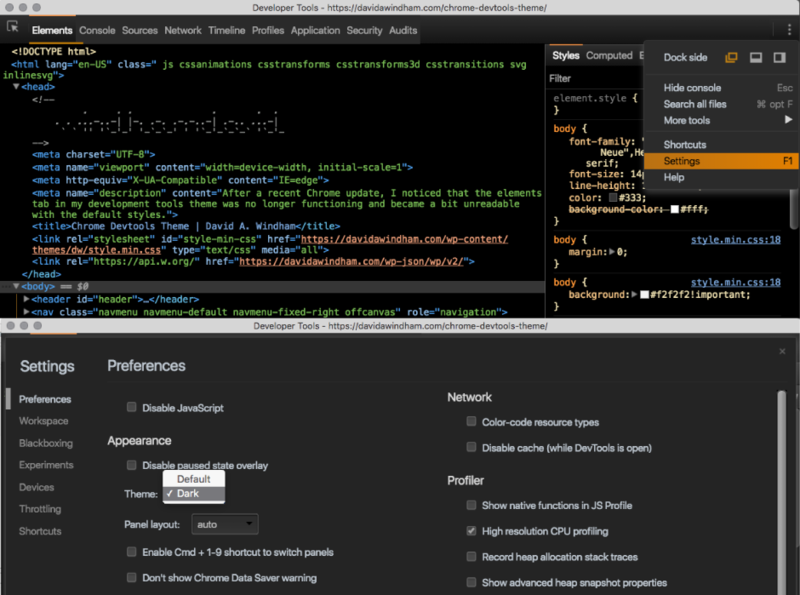 Update: In February, the Chrome DevTools team updated the settings to include a dark theme. In your devtools window, go to settings and change it to a dark theme, which will eliminate a couple little areas of this custom theme that still had default Chrome colored tabs. 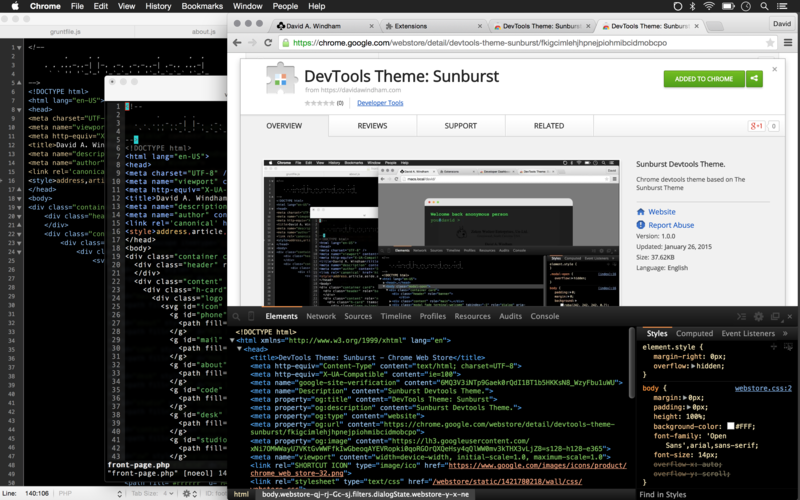 Update: Another update to Chrome borked this developer tools theme. I had a bit of time this weekend to tinker with it and get it back rolling. The updated version is published at the Chrome Web Store and in my git repository. I couldn’t figure out why the ‘.webkit-html-external-link’ styling no longer has any effect so I’ve left it pale. I’ll leave commenting on below if you have any solutions.